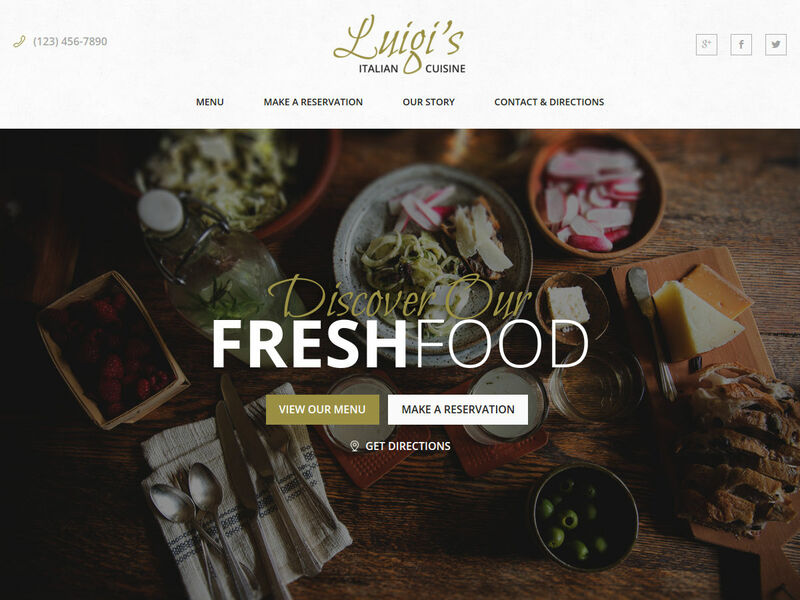 Today I released Luigi, a brand new theme for Italian bistros, fine dining establishments and any venue with a touch of class. Jump straight in and view the demo. Luigi has been in development for more than six months. It began in September when I hired Jonathan Atkinson of CR3ATIV to put together an incredible design for my next theme. Much of that time went into crafting it’s smart homepage editor. But I’ve also kicked things up a few notches in other ways. In that sense, Luigi represents a new departure for themes here at Theme of the Crop. And it’s priced higher — at $79 — to reflect that new approach. Theme of the Crop builds themes that don’t require a steep learning curve. That means my themes come with a limited number of options. Luigi goes one step further than my previous themes and provides better, smarter options — easy-to-use configuration tools that give you just the right amount of flexibility without a lot of fuss. I’ve already talked about the homepage editor, an extraordinary little tool which I’ll integrating with the themes I’ve already released in the future. But I’ve also put a lot of time into providing better support for customizing the colors and fonts. Luigi was designed with an adaptable color scheme in mind, and you can produce some compelling variations by adjusting just a few of the color options. Luigi also integrates closely with the Typecase plugin to provide an easy way to swap out the fonts used for any of the hundreds of fonts available from Google. Although my past themes have supported some font adjustments, they typically involved some CSS knowledge to assign the right font to the right text. Luigi comes with three simple targets to which you can assign a font, so you don’t need to look up any of the CSS code. Take a look at the Customization pages in the demo. I’ve been promising better events support in my themes for a long time. Luigi finally delivers, with an elegant integration for the free Event Organiser plugin. See the new event calendar under Features > Event Calendar in the demo. In other places, it’s meant looking for more performant alternatives to common needs, like adopting WP Featherlight to handle lightning-fast lightboxes for your photo galleries. Check out the Features > Photo Galleries page in the demo. In the coming months, I’ll be looking at my existing themes to add support for these customization options and the new homepage editor. As I integrate additional features, I’ll be revising their prices upwards to reflect their additional feature set. If you want to keep an eye on this progress, be sure to sign up to my mailing list.